TAKE2 Second Career Thoroughbred Program Inc. was created to promote second careers for retired Thoroughbred racehorses as hunters and jumpers. 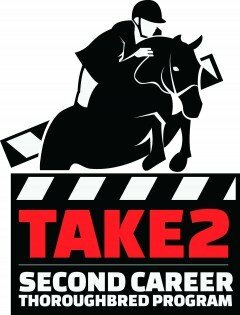 The TAKE2 Second Career Thoroughbred Program Inc. is committed to promoting and developing second careers for racehorses when they have retired from the track. Launched in 2012, TAKE2 is sponsored by the New York Thoroughbred Horsemen’s Association (NYTHA) and co-founder New York Thoroughbred Breeders Inc. (NYTB), as well as supporters from the racing and breeding industries. The Program funds prize money and awards in hunter and jumper classes restricted to Thoroughbreds that are eligible to be registered with The Jockey Club. Offered at AA-rated horse shows in New York, New Jersey (where it was sponsored by New Jersey Thoroughbred Horsemen’s Association) and Texas (where it was co-sponsored by The Paddock Foundation). TAKE2 has grown to include more than 300 horse shows in 10 of the 12 U.S. Equestrian Federation zones across 23 states. TAKE2 highlights the success of Thoroughbreds as show horses. The goal is to create a market for retired racehorses, ensuring secure futures beyond the racetrack. Join the TAKE2 Thoroughbred League!